Cover art for the Aprentice Stone novel is ready and it looks great! 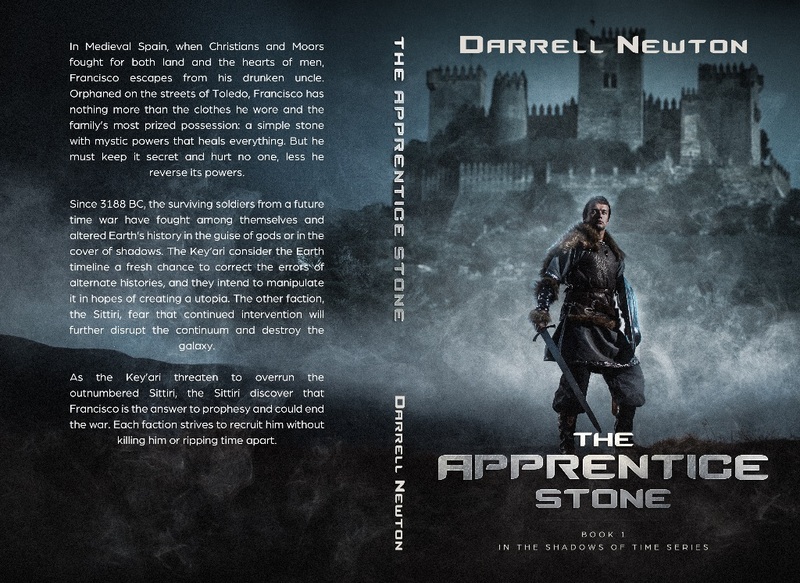 The cover art for The Apprentice Stone is complete! A shout-out to the artist who did a wonderful job. I would recommend Rebeca from RebecaCovers to anyone because she is flexible, quick, and talented. The knight on the cover is the main character Francisco when he’s in his early thirties. Francisco is 12 to 16 in this novel. The castle in the fog behind him is Almovodar Castle near Cordoba, Spain. Francisco spent some time here with Angelo as a captive of Prince Sidi Abbad ben Ali. As a result, this gives the cover a sense of realism and mystery that catches the eye. In Medieval Spain, when Christians and Moors fought for both land and the hearts of men, Francisco escapes from his drunken uncle. Orphaned on the streets of Toledo, Francisco has nothing more than the clothes he wore and the family’s most prized possession: a simple stone with mystic powers that heals everything. But he must keep it secret and hurt no one, less he reverse its powers. Since 3188 BC, the surviving soldiers from a future time war have fought among themselves and altered Earth’s history in the guise of gods or in the cover of shadows. The Key’ari consider the Earth timeline a fresh chance to correct the errors of alternate histories, and they intend to manipulate it in hopes of creating a utopia. The other faction, the Sittiri, fear that continued intervention will further disrupt the continuum and destroy the galaxy. As the Key’ari threaten to overrun the outnumbered Sittiri, the Sittiri discover that Francisco is the answer to prophesy and could end the war. Each faction strives to recruit him without killing him or ripping time apart. My first impression was, Wow! What do you think? On a scale from 1 to 5, how do you rate "The Apprentice Stone" cover art? 5 - Fantastic. Couldn't image anything better. 4 - Very good. It fits the blurb. 3 - OK. It neither rocks my boat nor turns my stomach. 2 - Meh. Could be better. 1 - This is perfect for the bottom of my bird cage.